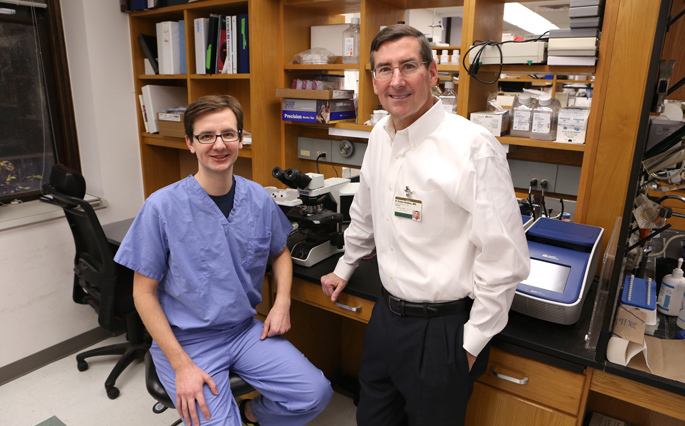 A team of Vanderbilt investigators has discovered that a specific factor is critical for the movement of certain white blood cells from the bone marrow to the lungs, where they participate in allergic and inflammatory diseases. The findings, reported in the Journal of Experimental Medicine, suggest a new therapeutic approach for asthma and other allergic diseases: preventing the cells that respond to allergens from getting to their sites of action. The studies may also improve understanding of why some people are more or less susceptible to allergic diseases. The research centers on a special type of white blood cell, called group 2 innate lymphoid cells (ILC2). ILC2 have been implicated in inflammatory diseases including asthma, chronic nasal and sinus infection, eczema and viral infection. In the lungs, they respond to the cytokine signaling factor IL-33, and therapeutics that aim to block IL-33 — and the resulting activities of ILC2 — are in clinical development. In studies led by Matthew Stier, PhD, a student in the MD/PhD program, the researchers discovered that IL-33 is critical for the movement of ILC2 from the bone marrow to the lungs. In mice missing IL-33, ILC2 developed normally but were stuck in the bone marrow. Both IL-33 and ILC2 are under intense investigation for their roles in asthma and allergic diseases, Peebles added. “From a basic science standpoint, understanding the biology of these cells and how they migrate is really important,” Peebles said. “From a basic science standpoint, understanding the biology of these cells and how they migrate is really important,” he said. ILC2 migrate from the bone marrow to peripheral tissues early in life, so that they can respond rapidly to pathogens and other threats. With prolonged inflammation, new cells may migrate from the bone marrow to repopulate the periphery. Stier used a mouse model of parabiosis, in which two mice are connected and share a vascular system, to demonstrate that ILC2 cells do migrate from the bone marrow to the lungs in older mice and that IL-33 dramatically increases the cellular movement. Anti-IL-33 therapeutics should block this movement and might “remodel the immunologic niche in the periphery so that it is less inflammatory,” Stier said. Stier demonstrated that mice missing IL-33 had increased expression of a particular receptor (CXCR4) on ILC2, suggesting that CXCR4 plays a role in retaining ILC2 in the bone marrow. Pharmacologic blockade of CXCR4 allowed the ILC2 to move out of the bone marrow. Other investigators have found that genetic variation in IL-33 and its receptor are important predictors of the development of asthma. Stier and Peebles speculated that variations in these genes may alter the number of ILC2 that move to the lungs early in development. “You could imagine that someone who gets too many of these cells in the lungs sets up a microenvironment that may predispose them later to asthma or allergies,” Stier said. Other Vanderbilt authors of the Journal of Experimental Medicine paper include Jian Zhang, Kasia Goleniewska, Jacqueline Cephus, Mark Rusznak, Lan Wu, MD, Luc Van Kaer, PhD, and Dawn Newcomb, PhD. The research was supported by grants from the National Institutes of Health (AI111820, AI124456, AI095227, GM007347, AI114262) and from the Veterans Health Administration (BX000624).